There are a number of advantages to owning Agena's 1.25" 12.5mm focal length illuminated reticle plossl eyepiece. The laser-etched reticle pattern is a dual cross-hair. Unlike eyepieces with single line crosshairs, the edge-to-edge double line reticle in this eyepiece doesn’t obscure small targets when centered – they remain visible in the tiny box created by the intersection of the two pairs of double lines. The cross-hair focusing mechanism makes this eyepiece ideal if you wear eyeglasses but want to use this eyepiece with or without them. The crosshairs can be focused simply by turning the uppermost knurled ring on the eyepiece in either direction. 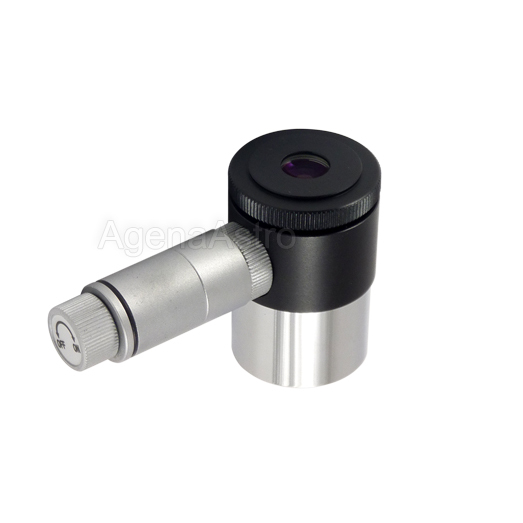 With a 40 degree field of view and mid-power magnification, this eyepiece provides a wide area with which to drift align your mount, calibrate finder scopes, manually guide, or center objects prior to attaching a camera to your scope for astrophotography. The 12.5mm focal length of this cordless eyepiece provides a 40° apparent view of the sky allowing you to find objects and alignment stars more easily than shorter focal length eyepieces. Eye relief is 5mm and all 4 lens elements are multicoated. With an adjustable illuminator, observers are able to illuminate the reticle just enough to see it clearly while not degrading night vision. This adjustable illuminated reticle eyepiece is a must-have for visual observers and astrophotographers alike. Illuminator requires 3 LR44 batteries (included). 4.6 (Based on 5 Reviews) 100% of reviewers recommended this product. I use the reticle for aligning my 15” Dobson. With the double line cross hair and illumination (which is easy to regulate at low intensity), it performs as advertised. from Agena Astro with very fair pricing. As good as the more expensive ones! Review by Joe T. of Hayward, WI. I like this product and it performs well but it has one flaw. To focus the illuminated reticle, one needs to twist the top of the eyepiece. The threads are very loose and it won't keep focus after removing or handling. This is a minor, but annoying quirk.